Summer weddings can bring the delightful challenge of dressing for both the heat of the afternoon outdoors as well as the cool night airs. So what do you wear? While I'm always a fan of the little black dress, for summers I like to opt for something with more color or lighter fabrics. I try to avoid anything too loud, as this day isn't about me and I want the bride to shine. However, I also want to show off my style and personality and never turn down a chance to compile an outfit that makes me feel great. Focus on the details instead to stand out: the cut of the item, pattern, embroidery... something a little unexpected. I chose a jumpsuit, as it allows me to stand out from the rest of the dresses while not screaming for attention. The lilac / light gray cotton piece is soft and perfect for hot summer days. Adding a pashmina as a shawl helps for when the temperatures dip as well as add a sense of refinery. 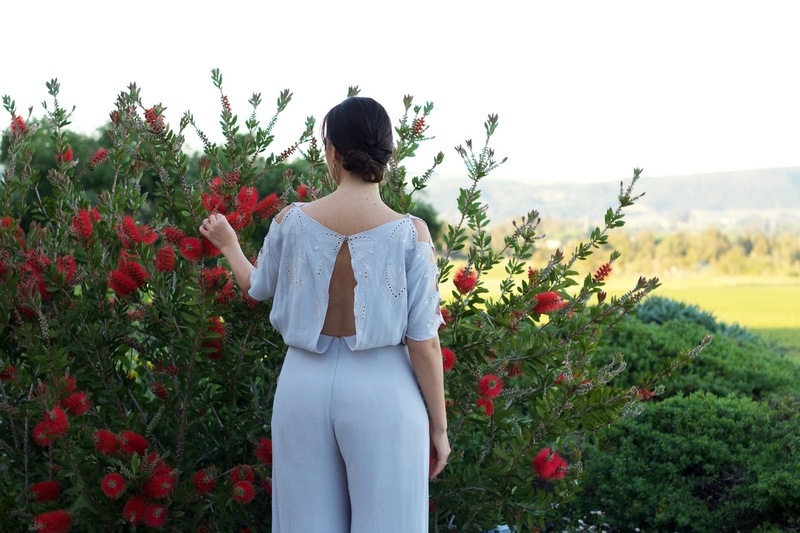 The details on this jumpsuit are my favorite and makes it special: subtle cutouts that add interest, dramatic wide legs that make a statement while balancing the top, and white embroidery that perfect the layers of this piece.